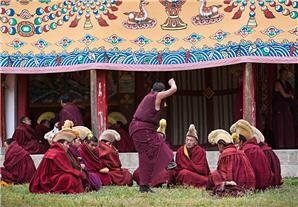 Chinese Valentine&apos;s Day is a traditional festival to express peoples&apos; love for each other. In China, there are many touching love stories that have been passed down for thousands of years, and tourist attractions to see associated with them. Located in Qianshan County of south-west Anhui Province, Tianzhu Mountain gets its name from its highest peak. On Tianzhu Mountain, traces of the Seven Fairies can be seen everywhere. It is said that Tianchi Peak (天池峰) was where they first descended. Also, there is Duxian Bridge (渡仙桥) and Tianchi (天池) which is for the Heavenly Queen Mother to bathe in. The overall highlight is Magpie Bridge. On reaching Datianmen (大天门), Magpie Bridge is seen right before your eyes. It is like an upright overpass crossing over the cliff and visitors can circle down along the stone steps under the bridge. It represents the bridge of magpies the cowherd and the weaving maid meet on during the Magpie Festival (Double Seventh, Qixi, or Chinese Valentine&apos;s Day). There once was a young, poor, but kind-hearted cowherd called Niulang, and an old ox. The ox actually was once the god of cattle, but downgraded as he had violated the law of heaven. Niulang once saved the ox when it was sick. In order to show its gratitude, the old ox helped Niulang get acquainted with Zhinü (a fairy, the seventh daughter of a goddess and the Jade Emperor) when she escaped from her boring life in heaven to look for fun on earth. Zhinü soon fell in love with Niulang and they got married without the knowledge of the goddess. Niulang and Zhinü lived a happy life together; Niulang worked in the field while Zhinü did weaving at home. After a few years passed, they had two children, one boy and one girl. 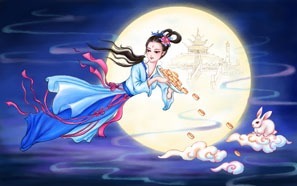 However, the Goddess of Heaven (Zhinü&apos;s mother) found out that Zhinü, a fairy girl, had married a mere mortal. The goddess was furious and sent celestial soldiers to bring Zhinü back. Niulang was very upset when he found his wife was taken back to heaven. Then his ox asked Niulang to kill it and put on its hide, so he would be able to go up to heaven to find his wife. Crying bitterly, he killed the ox, put on the skin, and carried his two beloved children off to heaven to find Zhinü. Just before he caught up with Zhinü the goddess of heaven took out her hairpin and created a huge river between them, and they were separated forever by the river that later became known as the Milky Way. Heartbroken, he and his children could only weep bitterly. However, their love moved all the magpies to take pity on them, and they flew up into heaven to form a bridge over the river, so Niulang and Zhinü could meet on the magpie bridge. 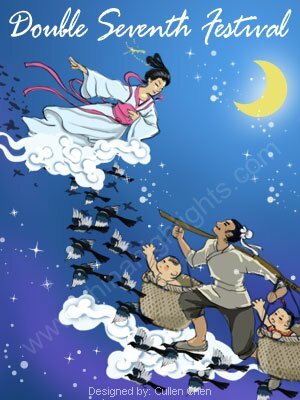 The goddess was also moved by their love, so she allowed them a meeting on the magpie bridge on that day every year (the seventh day of the seventh lunar month). 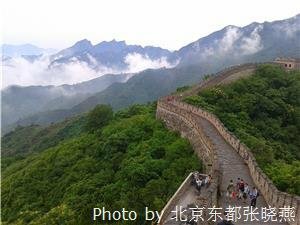 With several thousand years of history, the Great Wall is a wonder that was made by ancient Chinese laborers. Through the wash of time, the magnificent wall is still standing on the mountains. A legend of a woman seeking her husband and wailing on the Great Wall has also been passed down through history. In the legend, Lady Mengjiang&apos;s persistence of love and her emotional cry finally broke the myth that the Great Wall never fell. In the Legend of the White Snake, the Broken Bridge in the West Lake, is where the hero and heroine first meet and reunite. It is told that the White snake lived on a remote mountain, and was caught by a butcher one day, but she was saved by a shepherd boy. After one thousand years she became a beautiful woman, and looked for this shepherd boy in order to thank him for his kindness.The bridge witnesses their sentimental love and gains its reputation because of the legend. The Broken Bridge is situated on Bai Causeway. It is a one-arch stone bridge with 8.8 meters in length, 8.6 meters in width, and 6.1 meters in arch span. The renovation last year retained its simple and elegant style. On its east side stands King Pavilion (景碑亭), named for Emperor Kangxi, and a waterside pavilion bearing the words “in clouds, water and light”. The buildings and the bridge make up a classical picture of the north-east West Lake, attracting lovers to wander in the beautiful legend. Wansong College, located on the north side of Wansong ridge on Phoenix Mountain, is said to be the place where Liang Shangbo and Zhu Yintai got to know each other and fell in love. It said that Zhu Yingtai was a girl who dressed up like a boy to study at Wansong College with Liang Shanbo. However, Liang Shanbo found Zhu Yingtai was a girl in the end, and then they fell in love with each otherm but they could not stay together because of resistance from Zhu Yingtai&apos;s parents. Finally, Liang Shanbo died of a disease and then Zhu Yingtai commited suicide in front of his grave. They then became butterflies and flew away together. In the stone forest to the right of the college, scenes depicting 18 farewells are craftily arranged according to the terrain, such as Guanyin Hall (观音堂), Caoqiao Pavilion (草桥亭), and Single-Plank Bridge (独木桥). The beautiful legend adds some romance to the solemn college and, at the same time, the college provides a real site for the illusory legend.